Oysters are a delicacy that can be eaten raw or cooked, often used in soups, stews and fish pies. When you can't obtain fresh oysters, canned oysters can step in. While canned oysters may contain more nutrients than raw oysters, they are also higher in sodium, and their increased nutrients are only available if you consume the canning liquid. A 1-cup serving of raw oysters has 126 calories per serving, over 14 grams of protein and 4.3 grams of total fat. This makes oysters a naturally low-fat protein source. Raw oysters are rich in calcium, with 146 milligrams per serving, and iron, with 11.43 milligrams. They are also a good source of phosphorous and potassium. A 1-cup serving contains thiamin, riboflavin, niacin, vitamin B-6 and folate. In addition, a serving is rich in vitamin B-12, with 21.7 micrograms. Oysters are a good source of vitamins A, E and K too. Canned oysters are a low-fat source of protein, but they're higher in calories and fat than raw oysters. A 1-cup serving of undrained, canned oysters has 169 calories per serving, 17.5 grams of protein and 6 grams of total fat. Canned oysters also contain less calcium, with 112 milligrams per serving, but a serving is richer in iron, with 16.6 milligrams. Canned oysters contain more potassium, phosphorous and magnesium than raw oysters as well. They also contain vitamin C, which raw oysters do not, due to the addition of acid during the canning process. Canned oysters are richer in all of the same B vitamins, as well as vitamins A, but raw oysters contain more vitamin K. Undrained, canned oysters contain the same level of vitamin E as raw oysters. Some vitamins are water-soluble, meaning they leach out when exposed to water, while others are easily destroyed when exposed to heat, such as during the canning process. 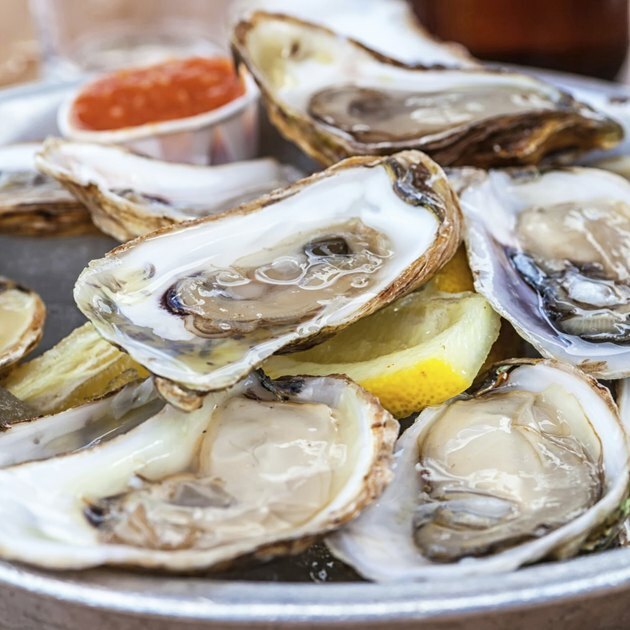 B vitamins that are present in oysters, including thiamine, riboflavin, niacin, folic acid, vitamin B-6 and vitamin B-12, are highly water-soluble, meaning they leach out when exposed to water during the canning process. Because of this, canned oysters drained of their canning liquid contain significantly less of all of these vitamins. Some vitamins are also heat-sensitive, such as vitamin C, folic acid and thiamine, as well as vitamin A. Drained canned oysters all contain significantly less of these vitamins than undrained oysters. For the highest vitamin and mineral content, consume at least some of the liquid from canned oysters. While oysters are known for their salty taste, a 1-cup serving of raw oysters has only 211 milligrams of sodium, compared to the 278 milligrams for undrained, canned oysters and 181 milligrams for canned, drained oysters. In all three cases, oysters are still high in sodium, providing between 7.7 percent and 18.5 percent of the recommended upper intake of sodium per day. The recommended upper intake is 2,300 milligrams per day, falling to 1,500 milligrams per day if you are 51 or older, are African-American or have a history of high blood pressure. A diet high in sodium increases your chances of heart disease, as well as high blood pressure. As the American diet is already naturally high in sodium, consume oysters in moderation. For canned oysters, while the liquid provides important vitamins and minerals, consuming all of it will also provide almost a fifth of your total recommended sodium intake.